When we where asked to produce a monument for the remembrance of all those who sadly lost their lives in the 9/11 terrorist attack. We worked very closely with Lionel Howell and both the local and American emergency services to come up with a design which had significance and will stand the test of time. Lionel had a vision, and with a lot hard work and dedication came up with the idea of having a piece of steel from the twin towers placed on show inside the memorial and also the design of the 4 hands (Representing all the emergency services) all supporting each other. We made his vision a reality, The stone itself is a light grey granite, finished with a rustic bolder edge. 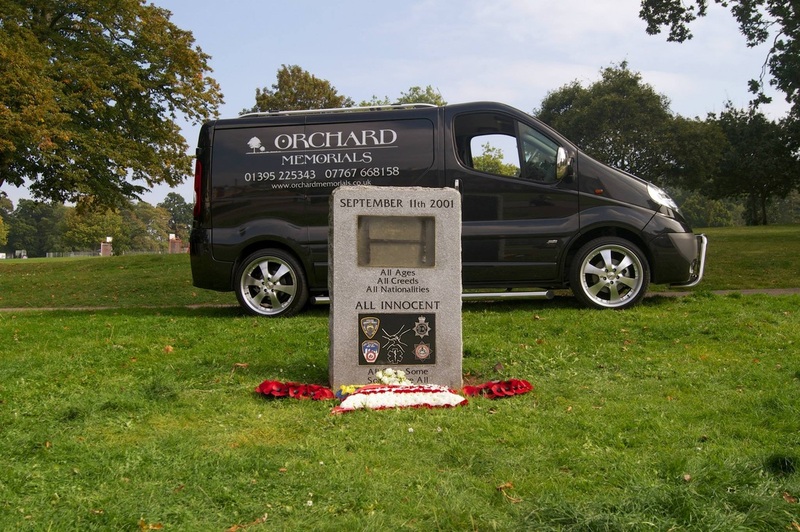 The piece of steel, which was blackened and had a vivid smell of smoke, (this was emotional, to say the least) is embedded in a clear resin, and the service badges are all original emergency services designs (special approval being granted for their use) incised on black polished granite and hand painted. The unveiling of the memorial, saw emergency crews from both New York City attending and our emergency service crews, it was very touching and now an annual event. So pleased were the New York Fire Crew of our design, in true New York City style, we did the monument twice, and believe the second version, is sited in a New York City fire station somewhere.